Getting started with game design can be a very daunting task. Whether you’ve designed games before or not, Twine can serve as a quick and easy way to rapidly develop new games. We’ll talk a little bit about the best ways to go about using Twine for making games, but first we need to talk a little about Twine itself. Twine is an online tool that lets you make text-based games. The games that you create in Twine end up being a lot like the Choose Your Own Adventure books of yore. There are many examples, Give Yourself Goosebumps comes to mind for us. For those of you who don’t know what we’re talking about, a Choose Your Own Adventure “game” is exactly what it sounds like: the game (or book) gives you choices, and your decisions impact the telling of the story. In a Give Yourself Goosebumps book it might be a choice like this: “you open the door and enter the cellar alone (turn to page 17)” “You turn and run the other way (turn to page 28).” Different decisions lead you down different paths in the story. This mechanic works in a much more layered way in AAA games, like the Witcher III, where your decisions can impact quests hours further into the main quest. With Twine, it’s more straightforward. Now that you know what it is, why use it? There are a few reasons to use Twine, and they’re all compelling! First, it’s free to use. Nice. Second, Twine is extremely accessible. 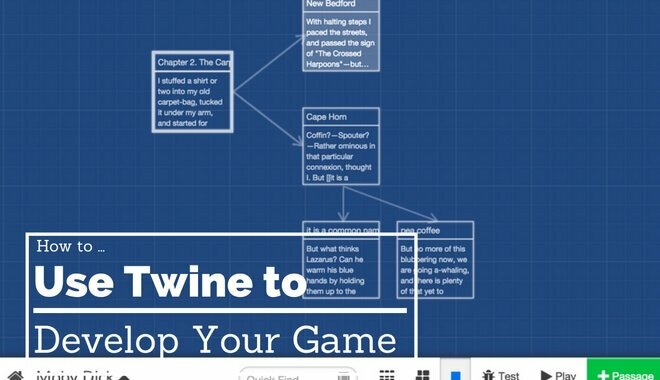 Whether you’re just starting with game design, or you have a few developed games under your belt, Twine can help you take your storytelling to the next level. You don’t need to know a lick of code in order to thrive with Twine. If you have some CSS skills you can use them to amp up the experience, but even if you don’t know that programming language you’ll be just fine. It likely won’t take you more than 10 or 15 minutes to get a solid handle on Twine’s basic functionality. Third, your finished game is just a webpage. You can plop your game anywhere on the web for people to play. We can see it now: your Twine games showing up all over the place, consuming the lives of hundreds of thousands of people, changing the world forever. You know what Twine is now, you know three reasons why it’s a great tool you can get started with now, but how do you actually use Twine to make games? You flex your storytelling muscles, that’s how! Because Twine is so simple, you’re able to focus almost exclusively on storytelling. The value there can’t be understated. Think about the trend of movie-games. Some games are including these narratives that make the game feel like an interactive movie rather than a traditional video game. Bioware excels at this. Think Jade Empire, or the Mass Effect games. They are without a doubt video games, we aren’t disputing that, but they are extremely story-heavy games. The first Mass Effect had you spending more time in dialogue options with characters than hunting the Geth and Saren (oops minor spoiler, sorry–although if you haven’t played Mass Effect yet, you should get on that!). Those character dialogues in Mass Effect are the AAA-coated interactions you can create using Twine. You have an opportunity to hone your storytelling skills because you’re not worried about elements of game design that come with non-text-based games. Can you surprise your audience with story twists? Can you depress them? Can you make them laugh out loud? Can you make them cry? With Twine, you can have a game up and running in just a few hours (or less if you have a shorter game in mind). If you need help on your interactive fiction creation quest, the internet is a good place to turn. There are a few solid tutorials that can help you get started with Twine, or get unstuck if you’re already waist-deep in designing your first Twine game. As far as being creative and coming up with an idea goes, you can turn pretty much anywhere for that. Use life as your inspiration! Turn your day, as you’ve experienced it so far, into a Twine game. What were your breakfast choices? What would have happened if you ate a banana instead of that honeydew melon? If that’s too cheesy for you then you can always turn to the internet again. A writer over at GameRant put together a list of some of the more interesting Twine games that designers have created. There’s everything from games that break the fourth wall, to games that simulate petting a cat. So, really, just get in there and have a little fun with it. Happy Twining!